MANILA, Philippines - Leading television networks ABS-CBN and GMA-7 have both claimed their supremacy in TV ratings for August 2016 based on different ratings providers in the country - Kantar Media and AGB Nielsen. In a report by ABS-CBN, the Kapamilya Network edged out GMA-7 by 14-point advantage in the whole month of August, 47 percent vs. 33 percent, according to multinational audience measurement provider Kantar Media. Meanwhile, GMA Network which only used dates of August 21 to 31 based on overnight data of AGB Nielsen in Urban Luzon said that the Kapuso channel registered a 40.4 percent household audience share, posting a 7-point lead over ABS-CBN’s 33.4 percent. 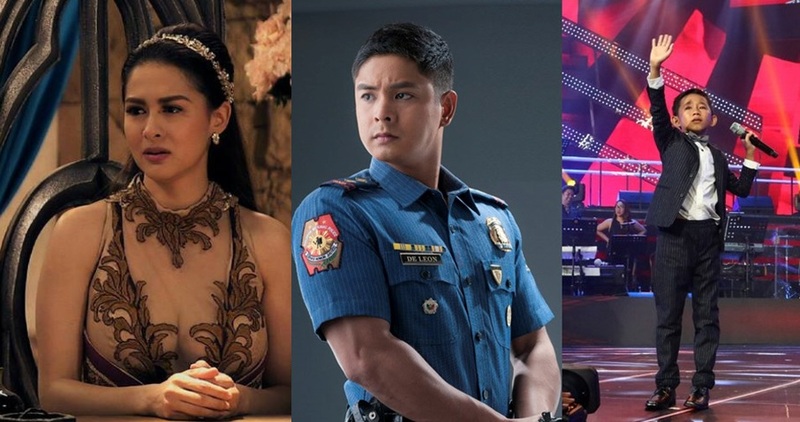 On the top of the list is the Coco Martin-led primetime hit “FPJ’s Ang Probinsyano” with an average national TV rating of 41.2%. It was followed by “The Voice Kids” (39.4%), which concluded its third season with young artist Joshua finally reaching his dream,and “Dolce Amore” (34.5%) ending a very high note with its worldwide trending ‘most beautiful’ finale. The return of James Reid and Nadine Lustre to primetime via “Till I Met You” debuted strongly on the seventh spot with 28.5%. Other Kapamilya shows in the top ten are “Wansapanataym” (34.1%), “TV Patrol” (32.7%), “MMK” (31.8%), “Home Sweetie Home” (28.2%), “Goin Bulilit” (27.2%) and “TV Patrol Weekend” (22.4%). Kantar Media uses a nationwide panel size of 2,610 urban and rural homes that represent 100% of the total Philippine TV viewing population, while the other ratings data supplier AGB Nielsen reportedly has 2,000 homes based in urban areas that represent only 57% of the Philippine TV viewing population. Compared to its closest rival, more programs from GMA also occupied the top 30 list of top-rating programs in Urban Luzon with the big-budgeted primetime series Encantadia leading the list of Kapuso shows. Besides Encantadia, other programs from GMA also dominated the top 10 including Magpakailanman, Kapuso Mo, Jessica Soho, Descendants of the Sun, Pepito Manaloto, and 24 Oras. Also in the top 30 list in Urban Luzon are 24 Oras Weekend, Ismol Family, Sunday PinaSaya, Hay Bahay!, Eat Bulaga, Juan Happy Love Story, Imbestigador, Lip Sync Battle Philippines, Wowowin, Karelasyon, and Bubble Gang. Nielsen data is gathered through a greater number of sampled homes nationwide in comparison to Kantar Media. Nielsen has a nationwide sample size of 3,500 urban and rural homes, bigger than Kantar’s sample size of 2,610. Which TV ratings provider do you believe - Kantar or AGB? Are you a Kapamilya or Kapuso? Tell us in the comment section below.